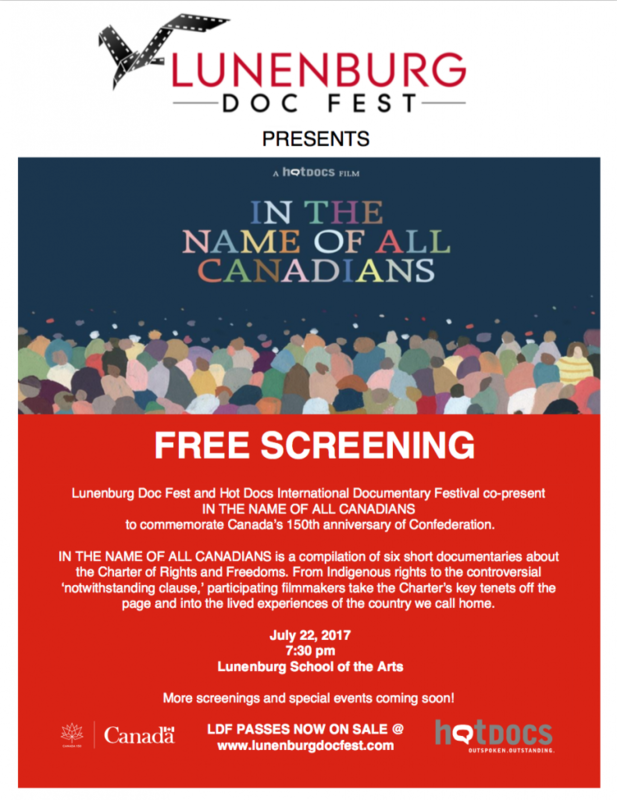 Lunenburg Doc Fest, in conjunction with Hot Docs International Documentary Festival, is bringing a collection of short documentary films to the Lunenburg School of the Arts. The Lunenburg event will be the only Atlantic stop on a cross country tour. Commissioned by Hot Docs, In The Name Of All Canadians is a compilation of six short documentaries that explore what it means to be Canadian through the lens of the Canadian Charter of Rights and Freedoms. At a time when many nations are redefining their self-image and relationship with other countries, it can be an insightful exploration to reflect on what constitutes being Canadian. The Charter of Rights and Freedoms is our foundational document, a commitment we have collectively made to ourselves. The film anthology brings the words off the page to show us some of the challenges and implications of our successes and failures to live up to these ideals. The screening and conversation will be held on July 22, 7:30pm, at the Lunenburg School of the Arts. There will be no charge to attend.